Happy 2016! It’s a new year and a new chance to build on good habits, make new ones, or just evaluate life and make some choices. With that I decided to do something a little different today, while keeping with some of the same good stuff. There is a recap of the past couple weeks/months, a little rambling, thinking outloud, plans and goals, and a delicious healthy recipe. This isn’t the post I had planned on posting, I had planned to be back in my kitchen finally after 2 long months of non stop remodeling our home and pumping out some recipes and posts that are on my list to make and photograph. Instead the last 2 weeks have been spent enjoying time with the family, resting, and relaxing in between our busy holiday schedule and hosting. Yesterday I had planned to post a different, a recipe that I had made photographed months ago, today. Last night I changed my mind decided to take a recipe I made earlier last week to test out my new photo set up (just a modified version of the light box my husband had made me in a scaled down version that could be pulled out and put away quickly and could be kept and stored in the dining room/kitchen). I made the last minute change for a number of reasons but mostly because it was quick, simple, healthy, something I crave and planned to make for breakfast again this morning! Part pineapple orange smoothie, part Cosmic Cranberry Kombucha, and champagne…. a delicious New Years Day Mimosa! So the last couple of months with no kitchen or a partial kitchen, it was rough! Not only not to have all the comforts we were use to but also having to eat out or make quick meals and not have all things foods we would normally consume and love. Not having a kitchen during the holidays was especially tough with baking but I managed to fit in enough of that the week before Christmas, thankfully! Other things I didn’t realize I would miss so much, stress relief! I enjoy spending time in the kitchen and when I get stressed I like to go to the kitchen and bake, cook, or just clean and organize it. To say that there was a little stress during the remodeling might be an understatement and at times I thought we took on way too much before and during the holidays having to have it all done before hosting Christmas. Little things like getting a tree later than usual, not having decorations up, not getting out to do tradional Christmas activities and trying to fit in shopping with limited time was rough. We had a couple weeks with only 3-4 hours of sleep a night and well I think we caught up on that this past week sleeping in past 11am! Crazy we felt like teenagers but the whole family slept in and I just rolled with it because I know our bodies needed it. Then there was no blogging. You may not have noticed since I still had posts but I had written and photographed a couple dozen posts to get through the remodel prior to starting on Oct 30th, the major stuff and demo happening on November 1st. Luckily I still had a dozen in que of ones I decided not to post over the past year for one reason or another so I still have 6 left for a “rainy day”. So while faithful readers may not have noticed that I wasn’t in the kitchen, unless you follow and caught a post on Instagram or Facebook, I was busy with tiling, painting, demoing, remodeling, decorating, running around and trying to keep up with comments during my few free moments as well as keeping connected on social media. While I kept up for the most part my heart wasn’t there and I wasn’t putting my all into it. It is what I had to do but I didn’t realize how emotional I would get about it. First feeling good about doing something different, then missing it, then feeling like maybe I should just stop blogging because I just couldn’t get back into it the last couple weeks but was really was enjoying time with my family. The blog started with something I love to do and do with my girls. As things get busy and A started school things changed. Things are always changing, like foods I eat and what works for me. Workouts and things I love to do and goals I have for myself. This past year changed as it went and I had a hard time adapting, with injuries my goals and plans changed. My foods have changed as they have over the years to what my body seems to need and that is going to continue to change so will my blog as I have always said it will stay true to me and what we eat and with my family eating different things I will post things they like that I make them, my favorites, and ones we all love. Life is always evolving and so will my blog, I have to just deal with that and that the people that enjoy it for one reason or another today may not tomorrow or next week just as I change and my followers lives change things will evolve and change and I can’t take it personally. Which brings me to the new year! Time to reflect, look back, and look ahead! I love cooking and being in the kitchen but did I really need to keep blogging or just do it for fun and not put the work into photographing and posting everything? My husband recently bought another 2 years of my domain so I felt I had to. Of course he said it doesn’t matter even if I stop he is going to keep paying so it is always there, for the girls and for me. There was the fact that we are always busy and that will never change, but with everything I do for the girls and my family I also need something for myself. I also decided weeks ago to take on a bigger role volunteering at A’s school which would take more of my time. Kids grow up way to quick and since I have the time and chance now to be there for her and her class and help out with talent development I feel that is where I want to spend more time. Extended family members to take care of like my grandmother. Which goes back to me, I need an outlet for me, something I enjoy doing and a place to focus all of my creative energy. Not that the cooking and creating would stop but I think there would be a part missing if I didn’t keep blogging. There are connections and friendships I have made and people I have inspired and I want to keep doing that. While I had made the decision I struggled this past week to get back in the kitchen and was going to lose hope but things just kept throwing signs, like my Perfectly Pistachio Chocolate Tart winning a Navitas Naturals recipe contest, which I still can’t believe. Kitchen was done just in time to whip out Christmas cookies! After finally deciding that I would keep on this path or journey it all became more clear, it was a little strange. A got a lot of cooking stuff for Christmas (and a balance beam from the best grandpa ever! ), she loves to cook and is a mini me in the kitchen and when things finally settled down these last couple days she asked to help me in the kitchen. Well with a kitchen stuffed full of leftovers that needed to be eaten up I just didn’t know what to make and really it didn’t make sense to unless we were using what was in the kitchen. When your little girl brings you ripe bananas and tells you there are ripe bananas you need to make banana bread, and you can’t remember the last time you made banana bread, well you make banana bread! So we did just that, she tweaked a few things, made choices her sister didn’t care for like using cacao nibs instead of chocolate chips and adding nuts but hey it was her choice and she loved it and was happy. Of course we made the mistake that everyone does, we smelled the banana bread and couldn’t resist and leave it there a couple minutes and tried to cut it while it was still warm. Oh well… until she wants to photograph said banana bread so “we can post it mama”! My little photographer! Not only is she a great help in the kitchen but she wanted to help photograph what we made! Yep I even let her hold the camera, which a 50D with a 100mm macro and a flash is not light, especially for a 7 year old. Once again I missed my old Rebel camera and think that for a number of reasons needs to be on my wish list this year. I sold it years ago when I got my Canon 50D thinking I wouldn’t need 2 cameras but it’s so heavy I don’t carry it anywhere. I use my phone for photographing on the go but that doesn’t compare and is another issue since it is having issues. My camera on my Note2 is having serious issues lately as well as the phone but I’m not sold on the Note5 or Galaxy S5 or any other phone. Have any suggestions I would love to hear those? So like I said this isn’t your typical post with all my ramblings but if you have stuck with me this long thank you! Here is the other thing that just made things seem like I made the right decision, besides my little girl spending time with me in the kitchen and reminding me how much I love it and need to make her helping with my blog posts more a priority instead of trying to fit them in during non family time which is something I have tried to do and a bigger struggle then I can explain but something I thought I had to do when things got crazy when really they enjoy it and I just need to maybe do the posts and social media stuff during those times. 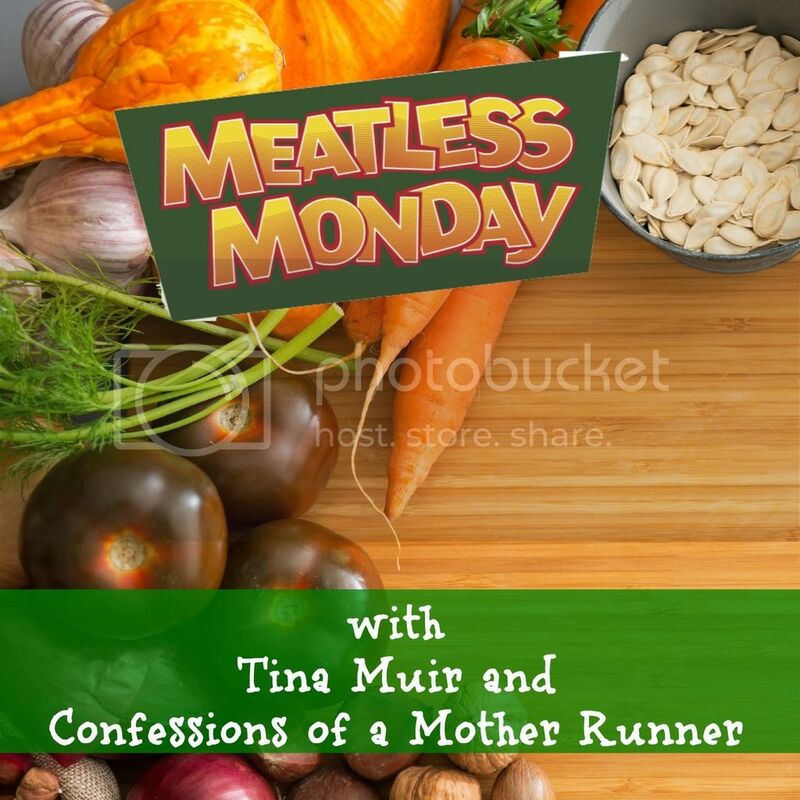 Then Saturday morning I woke up to an email from Tina, she asked me if I would like to take over Meatless Monday. Her kind words and even thinking of me for something I have been a part of for most of last year seemed like another sign so of course I said yes! I’m hoping to connect and inspire more people and taking this as a sign. I’m not going to lie I really did wonder if I should be adding another thing to my plate but I already post on Monday’s, I already link up for Meatless Monday and enjoy seeing what other bloggers post, and the timing I just have to take the chance since I said this is a year I need to “Take Whisks” yes that is what my Momentum (I am an ambassador for Momentum but do not profit from the sales and purchased these on my own. I just love their inspiring messages and want to support this wonderful small local business.) bracelet I got myself says because I thought it was a cute play on words for taking risks. So starting next Monday I will be co-hosting Meatless Monday with Deborah! Again if you have read all of this, seriously thank you, my husband just looked over and asked if I was writing a novel! If you are a regular reader you know that this is NOT my TYPICAL post. With that I would love to hear what you would like to see this year, goals you are working on, maybe foods you want to try that I could test first, or just why do you read my blog? With the new year you may be looking for a quick, easy, healthy breakfast so I decided to share one of my favorites, chia overnight oats! This one being a great fresh tropical version using fresh produce that is looking great right now, grapefruit and raspberries! Overnight oats, chia puddings, or even my overnight chia oats aren’t new but if you haven’t tried them, it’s a new year and I would highly recommend it! Quick to throw together the night before and quick to grab and go in the morning and they keep you full and fueled all morning, or afternoon if you are like me and also enjoy them for lunch or snack. Easy to customize with what you’re craving and your nutritional needs. I love this combination of flavors, the grapefruit is a great dose of vitamin C, raspberries are full of antioxidants and they are a bright flavor combo that looks as good as it tastes! If I need a little protein, or more vitamin nutritional boost I like to add Vega Coconut Almond Vega One (at Whole Foods) or for the kids just Vanilla Vega Protein Smoothie (at Whole Foods) and no grapefruit, or they love the Vega Tropical Tango Protein Smoothie with mango instead of grapefruit. Again use your favorites and what fits your needs these are just my favorites and suggestions that I like to use. I like to top with Brazil nuts for crunch (and because they are good for my thyroid) and shredded coconut. Have a little more time on your hand it is also great topped with broiled grapefruit sprinkled with cinnamon and a little coconut palm sugar! Cheers to a new year and a fresh, healthy, delicious start to a new day! In a glass jar or bowl combine oats, chia seeds, milk, stevia, cinnamon, and optional protein powder. Let sit about 10 minutes and stir again. Place in the refrigerator overnight, or a good few hours to thicken. 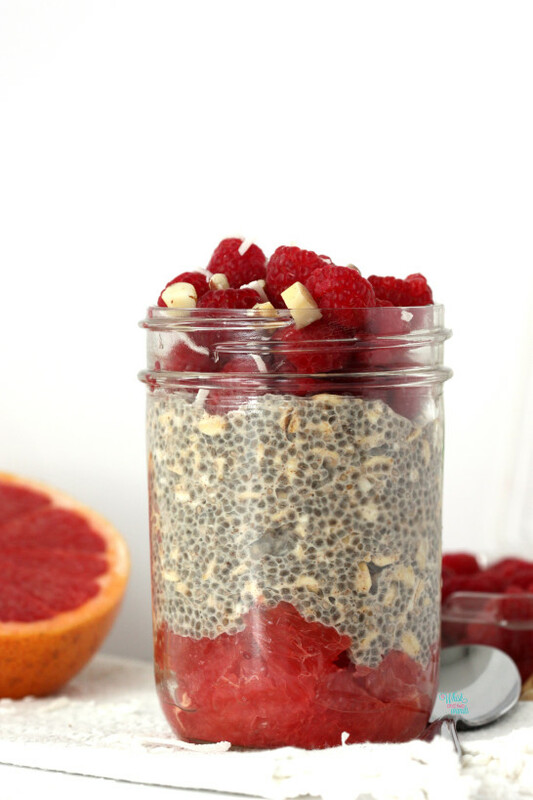 Slice grapefruit in half horizontally and using a grapefruit knife or citrus spoon remove the segments and place in a jar, top with oatmeal chia mixture, than top with raspberries. 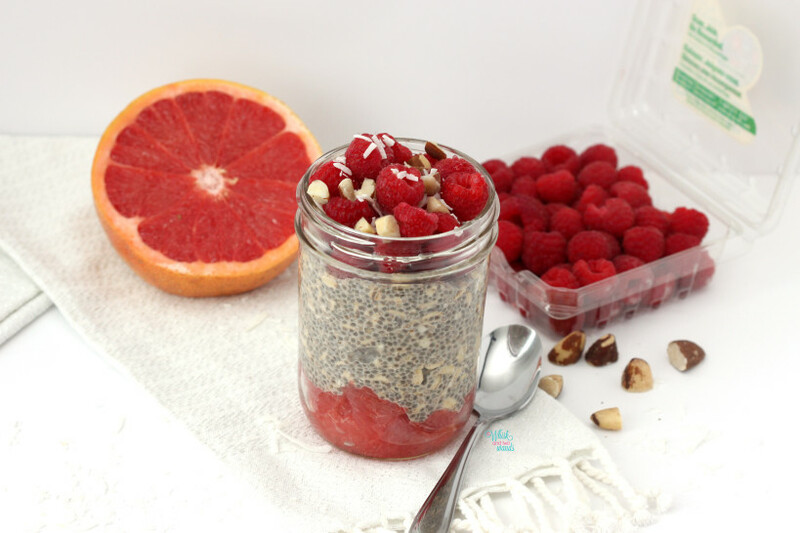 Alternatively you can just place the grapefruit segments and raspberries on top of overnight oats or just stir them in which is a great option for on the go or quick mornings. Enjoy! I would love to hear what you would like to see this year, goals you are working on, maybe foods you want to try that I could test first, or just why do you read my blog? Non food related, any phone suggestions, one you have that you love or hate, have your eye on? Thank you! It’s going to be fun, I’m looking forward to co hosting with you! Cheers to Meatless Monday! I often wonder what it would be like to stop blogging, but making the food and photographing it is such a huge love of mine that I honestly could not imagine life without it. I’m looking forward to you taking over meatless monday’s as well! I was doing the same stuff before I started blogging just posting on Instagram and Facebook and after people bugged me enough, companies reached out, and my husband bought my domain I finally took the leap. I think if I just took the blog portion away I would feel more “free” for awhile but then I think I would really miss it. Thank you, I am as well and hoping to continue to grow this wonderful community of amazing bloggers! It’s weird to think about my blog ever ending…it feels like it’s always been part of my life, but it’s only been 2.5 years. I don’t think I could ever fully stop. Slow down maybe, but not stop. Not weird at all! It depends on the day for me sometimes it feels like I have been doing it forever, some days like I just started… it will be 3 years next month! I use to post daily and I think 3 times a week, sometimes 4, seems to be a great balance for me right now. Cheers to you as well, here’s to one deliciously amazing year! Yum! This looks really good! :) I’ll have to try this combo since I’ve never had it! Thank you Heather! Such a fresh combo! Also great with mango and the Vega Tropical Tango Protein Smoothie if you have that on hand (it’s one of the girls favs)! On a side note, your kitchen also looks fabulous and I am so glad you are deciding to co-host meatless monday…awesome!! I love overnight oats and can’t wait to try this recipe! Thank you! I hope you enjoy it, see you next week for Meatless Monday!